Property 55: Beautiful Cottage On Water, Near Beach!! Property 60: Bay View Cottages overlooking Pemaquid Harbor about 150 feet from the water. Property 62: Oceanfront on John's Bay with Private Beach 50 feet from Cottage, New Harbor. Property 66: NEW LISTING! Waterfront cottage on the beach w/views of ocean and lighthouses! Waterfront Cottage Overlooking Barrett's Park, Short Walk to Town/Harbor! Property 74: Waterfront Cottage Overlooking Barrett's Park, Short Walk to Town/Harbor! 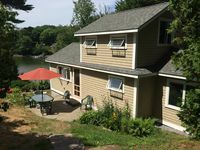 Property 81: Eclectic Maine Cabin / Great Location / extensive Water Views & LOBSTAH! Property 83: Wolfe's Neck Cabin: Perfect Old Style Log Cabin On The Shore Of South Freeport. Property 85: Cheerful Southport Island Waterfront Cottage, "An Tigin"
Property 86: "Top of The World Vista" Edgecomb Cottage! The cabin was fabulous. The view is exquisite and the facility is clean, modern and comfortable. We had a wonderful vacation in this cabin. The kitchen is well stocked for those who want to do their own cooking. The owners were very gracious and made us feel like we were borrowing a home from good friends. 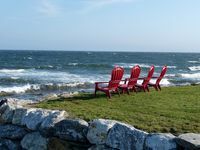 The location is ideal for exploring mid-coast Maine and the peninsulas. Very convenient to Bath which is a charming town with many fun things to do, great food and great. shopping.